Reading a version of a report (August 2017) on the telecommunication competition market study in Kenya by Analysys Mason (AM) of London for the Communications Authority of Kenya presents some startling observations and unwieldy regulatory recommendations. They regulatory target is the telco – Safaricom, which is the market leader in Kenya’s telecommunications and mobile money space. The reports documents areas where Safaricom is dominant as well as other telco spaces and areas where other companies like Telkom Kenya, Airtel, Wananchi, Equitel (from Equity Bank) and Multichoice (who were beyond the scope of the study) also dominate. The AM report looks at the current state of the telecommunications sectors, but it ignores the reality of how it got to be where it is – the history of telecommunications in Kenya, strategic-decision-making, investment & management decisions, price wars, new technologies like mobile money and fibre cables etc. Safaricom is by far the largest operator, with a 65% market share. Bharti is a distant second with a 15% share. Safaricom’s dominance has come down from a peak of ~80% a couple of years back as the smaller operators have become more aggressive.. while they both launched in 2000, Kencell (now Bharti) focused on the quality of network and high ARPU customers, Safaricom focused on the mass market. Also innovations like per-second billing, which Bharti took some time to introduce and M-PESA also helped (Safaricom) cement its dominant market position and Safaricom’s stable management in contrast to Zain’s frequent management (1. Kencell 2. Celtel 3. Zain 4. Bharti) changes also helped it compete more effectively. Kenya has other dominant players such as EABL (alcohol), BAT (cigarettes), Kengen (energy production) and Brookside (milk), but the Communications Authority (CA) is the only agency that can declare if there is a dominant telco market player. In the past, the CA has pushed some changes to level the telco field such as rolling out number-portability, the ending of mobile money agent exclusivity, and the upcoming rollout of mobile money interoperability. The range and messaging of different Safaricom promotions like Tunukiwa, Bonga, Flex and now Platinum, is sometimes confusing but they should not be restricted from competing and innovating. Already, another investor report by Citi has already expressed concern about the impact on telcos of some of the regulatory recommendations in the AM report including that they may have effects that will be unclear, they do not foster innovation, and they may result in high prices. The AM report notes that there is some concern among investors in that, as Safaricom has maintained a high share of the market for many years and that recently Essar/Yu exited Kenya (2014), Orange sold out (to Helios who re-branded as Telkom-Kenya) and Bharti indicated that they may also consider leaving Kenya, and perhaps other countries in Africa. 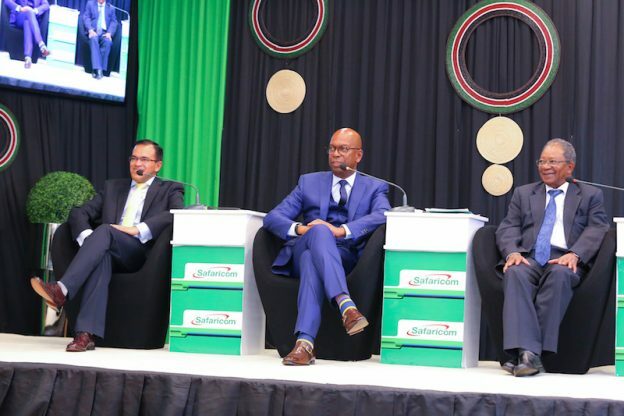 Finally, Safaricom is a vertically-integrated company, and dominant players come and go and they evolve over time as market forces, customers, and technologies changes. The AM report notes the introduction of Pesalink, which can be seen as a reaction by the banking sector to M-Pesa, and it also cites the use of Equitel – on average, a Safaricom M-Pesa subscriber makes 6 transactions per month, whereas an Airtel Money subscriber makes 0.6 and an Orange Money subscriber makes 0.1. However, the average Equitel subscriber makes 10 transactions per month – AM. No one knows what the telco sector will look like in the next decade, but the consumers, not regulatory muscle, should be the decider. This entry was posted in Airtel, Investing in Kenya, kenya communications, Safaricom, Safaricom profit, Safaricom success, Telkom Kenya on March 3, 2018 by bankelele.